Analytical capabilities at the CRLB are designed to meet the individual needs of investigators and their research projects. Sample sets vary from 100-specimen product evaluations to batch analysis of 100,000 vials for longitudinal epidemiological studies. Using internal facilities for blood, urine and filter paper specimen analysis and a robust Quality Control program, the CRLB has developed strong expertise in emerging and specialized testing of specimens numbering almost 100,000 specimens for a single study analysis. Please contact us regarding your specific analytical needs. 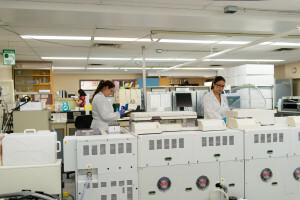 This flexible infrastructure is complemented by a strong link with the Core Laboratories of the Hamilton Regional Laboratory Medicine Program which provide a broad range of established analytical testing. Data quality is our most important product. Reliable methods are utilized and new methods must pass a strenuous validation process to ensure our standards for precision and repeatability are met before the method is applied to study specimens. Established partnerships with suppliers allow us to avoid or minimize the impact of changes in methodologies during study analyses. The CRLB also participates in collaborative projects with individual researchers or private diagnostic companies to evaluate method performance. Our strenuous Quality Control system features real-time data verification, use of standardized calibrators and 3 to 4 levels of control on every assay run. 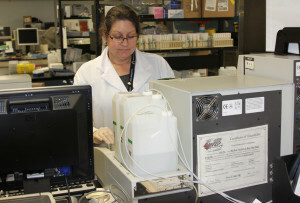 Both commercial control preparations and internal pools are utilized for each assay system. In addition to standard acceptability practices utilized by instrument operators, data are screened electronically for variation in control and patient levels on an ongoing basis throughout an analysis. 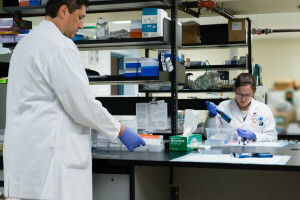 Comments on specimen/test results affected by nature of specimen or deviation from protocol are included with each dataset to allow for interpretation by the investigator(s). Here is a list of tests we have validated and performed to date.